Basic configuration of a permanent magnet DC motor is very similar to that of a normal DC motor. The working principle of any DC motor is same, i.e. when a current carrying conductor is placed in a magnetic field, it experiences a force. A permanent magnet DC motor also works on the same principle. In a PMDC motor, permanent magnets (located in stator) provide magnetic field, instead of stator winding. The stator is usually made from steel in cylindrical form. Permanent magnets are usually made from rare earth materials or neodymium. The rotor is slotted armature which carries armature winding. Rotor is made from layers of laminated silicon steel to reduce eddy current losses. 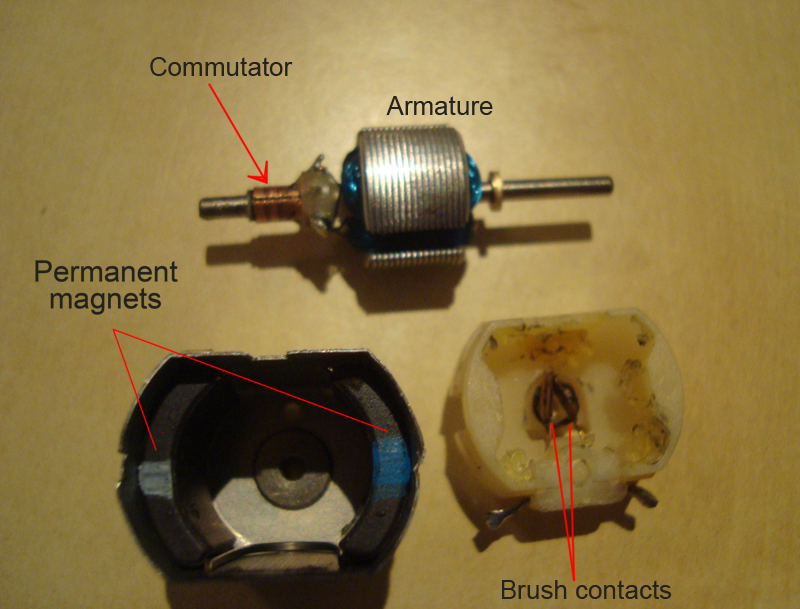 Ends of armature winding are connected to commutator segments on which the brushes rest. Commutator is made from copper and brushes are usually made from carbon or graphite. DC supply is applied across these brushes. The commutator is in segmented form to achieve unidirectional torque. The reversal of direction can be easily achieved by reversing polarity of the applied voltage. Characteristics of PMDC motors are similar to the characteristics of dc shunt motor in terms of torque, speed and armature current. However, speed-torque characteristics are more linear and predictable in PMDC motors. Permanent magnet dc motors are extensively used where smaller power ratings are required, e.g. in toys, small robots, computer disc drives etc. For smaller ratings, use of permanent magnets reduces manufacturing cost. No need of field excitation winding, hence construction is simpler. No need of electrical supply for field excitation, hence PMDC motor is relatively more efficient. Since the stator in PMDC motor consists of permanent magnets, it is not possible to add extra ampere-turns to reduce armature reaction. Thus armature reaction is more in PMDC motors. Stator side field control, for controlling speed of the motor, is not possible in pemanent magnet dc motors.